Many advertisers look to reference famous copyright works in ad campaigns, whether they be paintings, photographs or music. We often get asked whether the copyright owner can stop the advertiser from taking inspiration from the original work in the campaign. We usually explain in these situations that (1) copyright protects the artist's expression of an idea rather than the idea itself; (2) the proposed copy either does or does not reproduce that “expression” of the idea, and (3) even if there is no copying, the ad might (unlawfully) suggest a connection between the brand and the artist. We often rely on experience to work out the level of risk on any such campaign, as there are rarely any cases we can point to that definitively answer the particular example. This is why we always keep an eye out for judgments where there seems to be some inspiration taken from an original. And a recent case in Italy caught our eye. Italian artist Emilio Isgrò is well known for a number of artworks featuring redacted text (see the right hand image below, reproduced from the brilliant IPKat blog). 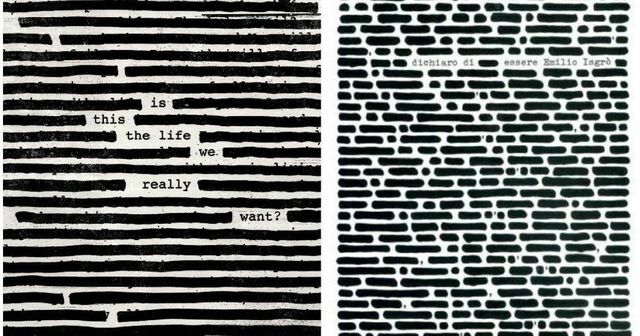 However, Roger Walters (of Pink Floyd fame) then brought out an album featuring a similar redaction style, with the unredacted words spelling out the album title “Is this the life we really want?” (see the left hand image below). Isgrò applied to the Milanese court for an injunction to prevent the sale of everything associated with the album, which was granted. While the case has now settled, the court had decided that while copyright only protects the expression of the idea, the album cover had expressed the idea in essentially the same way and that it therefore infringed the artists copyright. Each case needs to be assessed on its particular facts. However, this is a useful example for advertisers to see how taking inspiration (either deliberately or not) can infringe third party rights.